3.8 out of 5 based on 10 bloggers and 1 commenters. 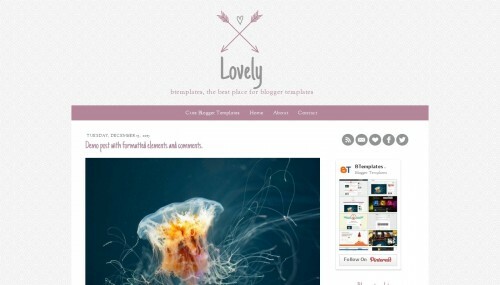 Lovely is a free blogger template with 2 columns, right sidebar, an exclusive design for Blogger, social bookmarking icons, cute design, girly looking and simple look. Excellent template for blogs about crafts, to write a diary or love. Like its name . The template is also looking Lovely . Thanks for sharing.